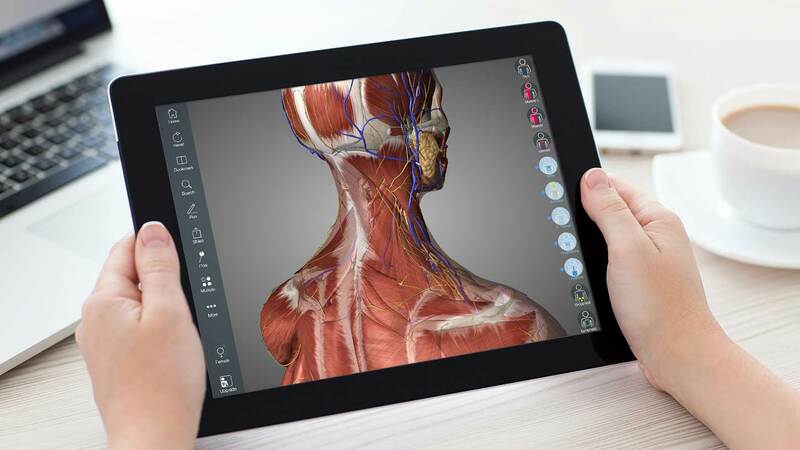 The most successful anatomy app of all time, Essential Anatomy 5 is used in universities and hospitals around the world due to its engaging and easy-to-use 3D model and features. Each of the over 4100 highly detailed anatomical structures contains an audio English pronunciation and Latin nomenclature, along with a detailed description. The new anatomical models are designed and built to allow for more detail and exceptional performance. Essential Anatomy 5 contains 11 complete systems which can be accessed from the main screen. These include; Muscular, Skeletal, Connective Tissue, Venous, Arterial (Including the Heart), Nervous (Including the Brain), Respiratory, Digestive, Lymphatic, Urogenital, and Skin. Strip away multiple layers of muscle using the 'layering' tool. Begin your anatomical studies with Essential Anatomy 5, for exploration of the body's systems and structures. Explore and compare differences between male and female anatomy. Completely distinct models allow for even greater detail on gender-specific structures and models can be easily switched with just the tap of a button. View structures in isolation, manipulate them freely or choose thumbnails of common anatomical terms of location. Understand relationships between neighboring structures. Compare numerous structures with Multiple Selection. Drop customized pins to any structure for quick referencing. Test your knowledge with quiz functionality. Choose between Drag & Drop or Multiple Choice and test yourself on any system within the app. You can even refine the quiz on the basis of regional anatomy. In-app purchases allow additional muscle and skeletal content to be downloaded and accessed from within the app. These boosts add muscle insertion and origin points, skeletal bone parts and surfaces and hundreds of animations detailing movements for each articulation.